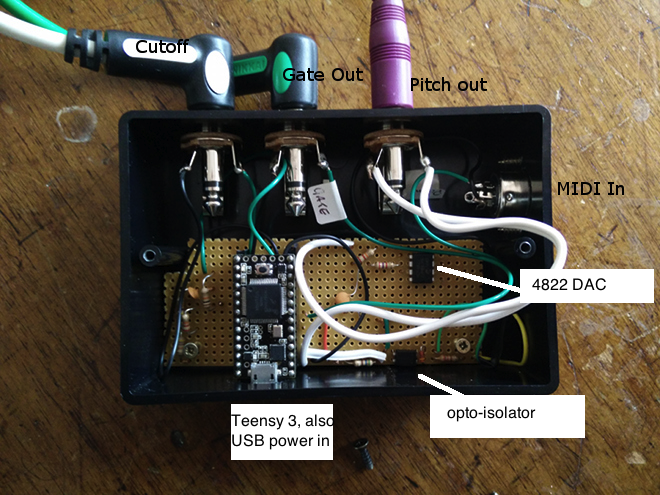 Marc Nostromo has a really good page on how to setup the Teensy to receive Midi signals via USB from a computer. 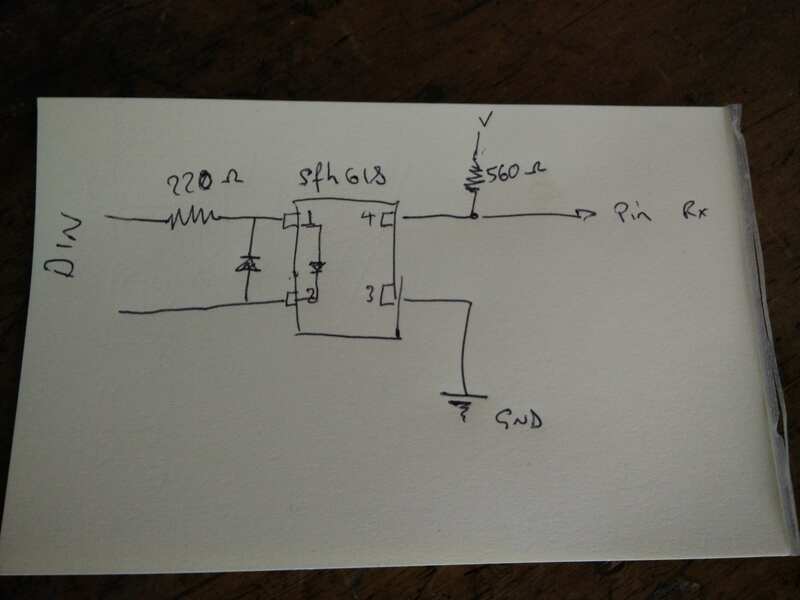 However, I needed to have the teensy 3 receive the Midi information via a midi DIN connector from other synth equipment, as I didn’t want to use a computer to send the info. Well, it was as straight forward as hooking up the midi connector to the Serial1 port of the Teensy 3, and then read this incoming data out via Marc’s code with some small changes. Hooking up the Midi connector to the Teensy3 Serial1 pins requires the signal to be sent through an opto-isolator to protect the Teensy circuitry. I did run the input without the opto-isolator, and it survived, but better to be safe than a dead Teensy3. In my setup, I have decided to keep the micro-USB port of the Teensy3 accessible through the housing so that i can reprogramme the Teensy, and I can power the converter via the USB port using a 5v USB connection either from a wall charger or a computer. 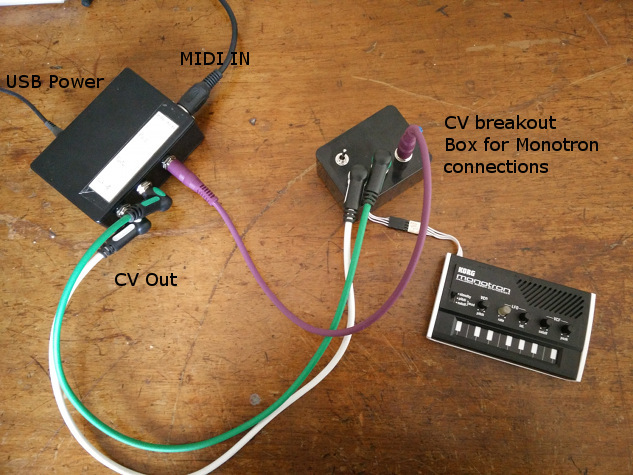 The monotron breakout box was used, rather than having fixed connections, so that the converter can use 1/4inch jacks. This means that I can use the box for other equipment, and not just the monotron. here is the wiring diagram for the opto coupler. The schematic and arduino library is described in this link to PJRC Midi connector page. 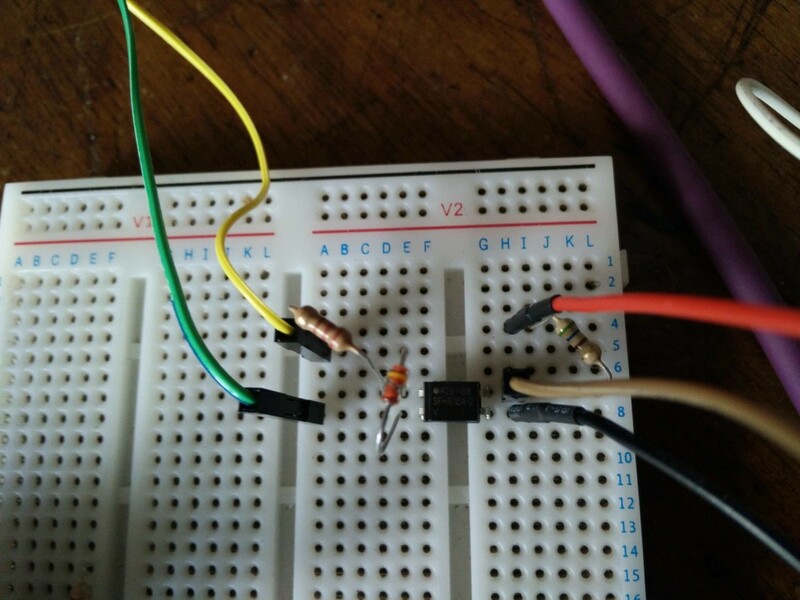 Midi In -> optoisolator -> Teensy3 Rx (pin0) -> splits signals to Pitch/gate/cutoff.